Cris Cyborg and Amanda Nunes during their co-main event bout at UFC 232! Following her 51-second UFC 232 co-main event loss to Amanda Nunes, Cris Cyborg released a video on her YouTube channel, of her being around some of the biggest and brightest stars, not only within the fight game but also away from it. Academy Award winner Halle Berry, and Olympic Gold Medalist in Boxing, Claressa Shields, were seen consoling the ex-featherweight champion, in the video, amongst other celebrities that featured on her channel. In case you didn't know..
UFC 232 was witness to one of the most unexpected knockout finishes that the world of mixed martial arts, has ever seen. Reigning female Bantamweight Division Champion, Amanda Nunes, shocked everyone in attendance at The Forum, in Inglewood, California, with a bludgeoning 51-second knockout victory of arguably one of the most dominant female featherweight champions, of all time, Cris Cyborg. Cris Cyborg has suffered only two losses in her lustrous MMA career, so far, with the second one coming from the hands of Amanda Nunes. Following the match-up, Cyborg's 13-year undefeated streak came to a sudden halt, leaving fans around the world debating what could be next for the former UFC featherweight champion. Following her defeat at the UFC 232 co-main event, Cris Cyborg released a video on her YouTube channel, and surrounding her were some of the greatest names in the sport of mixed martial arts and the show business. One such celebrity was Olympic Gold Medalist in Boxing, Claressa Shields, who was seen critiquing the ex-champion's performance against Amanda Nunes. 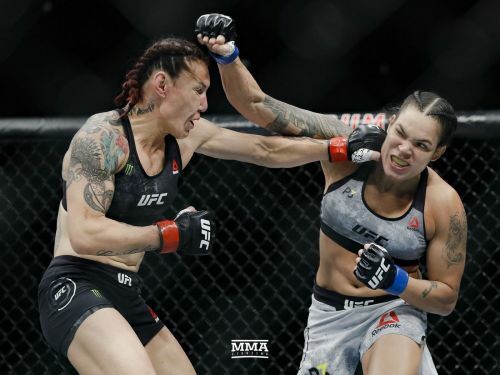 Although many experts of the sport may believe that a defeat like this doesn't add up to the possibility of an immediate rematch between the two, Cyborg thinks otherwise. Current women's double division champion, Amanda Nunes, is expected to defend both her UFC belts as soon as she will be willing to step into the Octagon, once again. A rematch between the two UFC 232'ers is a definite and very lucrative possibility, but do you think Cris Cyborg is deserving of an immediate rematch considering her most recent performance? Leave your thoughts and opinions in the comments section below!